The Winner of the March Pet Photo Contest is..
Congratulations Giupetto and Gianna! 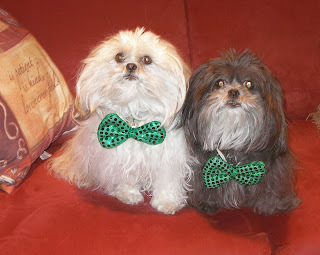 You both look so adorable in your St. Patrick's Day bows! Your photo will be PetsJubilee team store avatar for the month of April. Gianna & Giupetto have won a free PetsJubilee Pet Sampler box full of goodies, samples, accessories and treats. Their mom runs DianaDesignsNY on Etsy, a very popular shop which specializes in custom sweaters, dresses and costumes for the pampered pet. She also has a second shop, StylinDogsBoutique which is full of premade doggie wear including hats and caps, and a special section for dog toys and cat toys, too. Please stop by these two shops for some great doggie duds. "This is my pup, Mojo! He is a Wheaten Terrier mix, mixed with WHAT exactly no one knows!" "Meet Daisy the Dachshund who will be 7 in May. She loves posing for the camera and making funny videos (as seen on my blog) but mostly loves it when she gets free treats and maybe a squeaky out of it. She’s a spoiled Princess but def deserves it. She’s our Lucky Star! We have gone through a lot of obstacles in the past 2 years with Family Deaths, Stress, Hospitals and so much more and Daisy has always been there with open Paws, comforting us in every way she can. From Day 1 when my sister saw her in the puppy store window, we were totally head over heals with her. It was hard for her to gain our trust as she clearly had been abused to some extent in the store, but with lots of love and kissies (which she absolutely loves to give), she became part of the family and learned that she means the world to us. We have many names for her…but she truly is our “Little Sunshine.” Sure she loves her treats, especially chicken, her toys and feels Lucky to have a Wonderful Home, Family & Friends who LOVE her to death, but I think in reality, we are truly the Lucky ones, because she has changed our life in so many ways and we could never imagine Life, without her in it!" "This is Tansy Button. 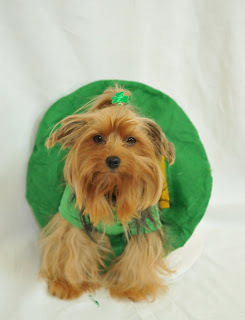 She's a 3 year old Yorkie and she loves to dress up for each holiday, as long as we promise to take her picture. She has been a wonderful addition to the family! She was a bit of a "Yorkie breeder Reject" because she grew more than she should, has a lot of white hair, has cottony hair instead of the typically wirey terrier hair, and her ears won't stand up. Her personality outshines it all. She works st a therapy dog and we make visits to hospitals and nursing homes together." Big Mac and Molly are my two babies (both cockapoos) and the namesakes of my shop. I got the great idea to take pics of them as "angels" for "advertising"...coerced my daughter into helping me, but as you can tell from Big Mac's expression, the pups could not have been more against it. This pic was probably the 40th one taken and they had had enough! Once I showed the pics to my kids (the people ones), they all threatened to disown me if it put them out publicly so......they remain in my "personal collections"...Oops, gotta go...puppies coming and if they see this pic on the computer screen I'll be out on the street!! ;-)"
"Pepie was adopted from Italian Greyhound Rescue. We think we are very lucky to him in our lives." "I love Saint Patty's Day! She's my heroine! She and her son bought me from that lonely pet store (even though she thought I was a rat at first...I forgave her) and brought me to this friendly house full of humans. I am the proud papa of three children and two grandchildren, and I'm only 2 1/2!! What a life! I LOVE Saint Patty! (But I HATE this skirt....geez!!)" "Mommy and Daddy say that they are very lucky to have us in their lives, but we think we are the lucky ones (even if they make us wear things like these bow ties). 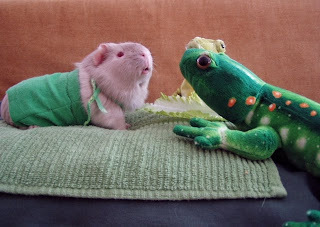 Mommy explained it was in honor of St Patrick's day, and that we look cute in them. So we gave her our best smile. 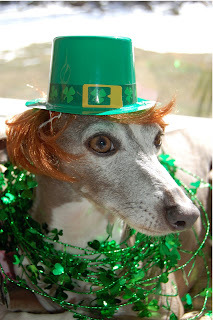 In honor of St. Patrick's Day, this month's contest theme is "Luck of the Irish." What lucky thing has happened to your furbaby or to you because of your furbaby? What events lead up to you finding each other? 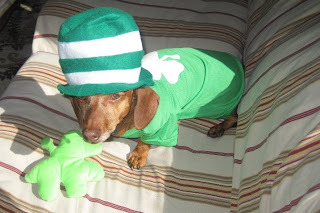 Maybe you have an Irish Setter or your furbaby in an Irish, festive, green, St. Patrick's day setting that you'd like to share. Send in your photo, slide show, or video of your lucky pet. Add some words to be posted with their pic to go along with the theme. We'll accepting entries from March 1st through the 14th. Visit us in the forums where we'll be hanging out and introducing the new entries until voting begins on the 15th.